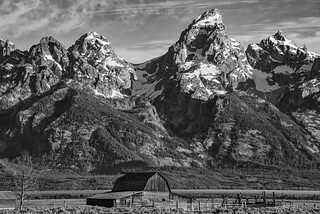 Mormon row is a spectacular old homestead located in Jackson Hole Wyoming. The settlers began homesteading here from 1908 to around the 1950's, constructing farms, barns, fields, corrals, and even drainage systems. The area is known as Antelope flats, and is located in both grizzly, and moose country. It's a spectacular area photographically speaking, as you've got the amazing and beautiful Teton range for a back drop.